If, after many centuries of being reflected in the Riviera’s water, the presence of an ancient pagan arcade in the frontal facade of this house is surprising to us, it must have been even more striking in mid-sixteenth century by Palladio’s contemporaries. Until then, no one had thought that his arcade could make such an incredible impact on a private house’s facade. This must have been striking for his contemporaries at that time. 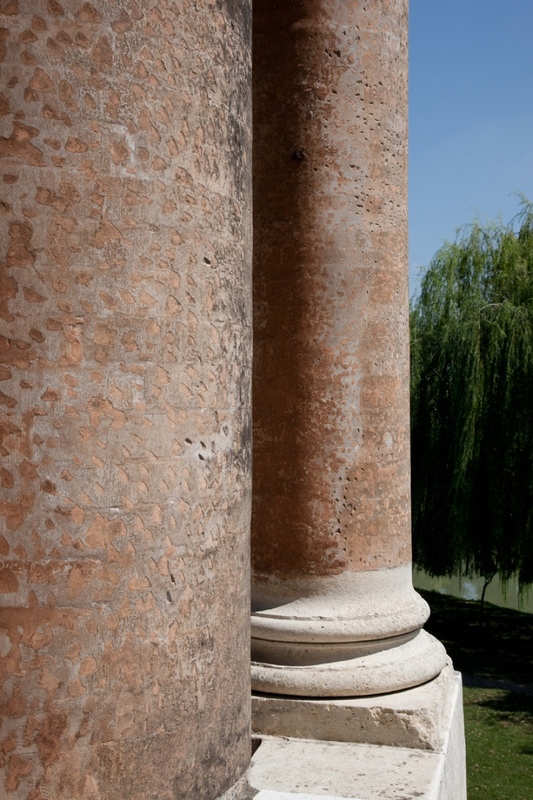 This Venetian one, because of its structure, has roots in Roman republican foundations. Republican foundations are reminiscent of the glories of Imperial Rome, or those of the Pope’s who thought they were the heirs to the political authority of the ancient emperors. Palladio, to avoid such an interpretation and to evoke the virtue of ancient Republican Rome, excluded the use of stone from his architectural project and showed the “poverty” of sandstone (of which the bases and capitals of the columns were made) and of the latericium material, of which columns and all the elements of the order were made, meaning the facade and the cornice that surrounded the house. 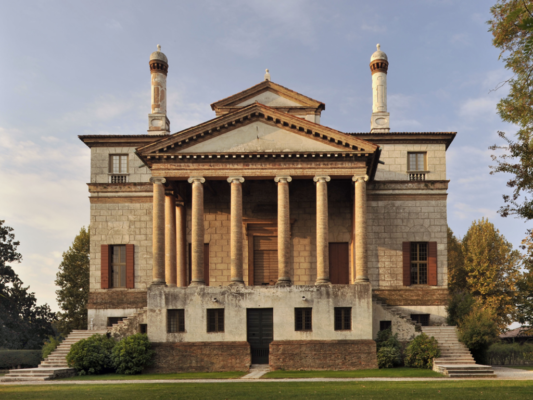 With this choice, Palladio did not only want to avoid a dispute of his architecture based on ideological claims, but he wanted to acknowledge that architecture should be judged by the richness of its materials and the quality of its forms. Palladio, being a great architect, knew how to manage the figurative outcome of his theoretical propositions perfectly. One of the most alluring connotations of the external facade of this noble architecture is the terracotta colour against the whiteness of the marble plaster, which contributes to an interesting chromatic contrast. This great arcade is accessed by side stairs that evoke the form of an ancient temple that Palladio himself had observed at the source of the Clitumno river in Umbria. A basement of this height, which cannot be found in any other Palladian architecture, contributes significantly to the importance of this house, which dominates the rural landscape for as far as the eye can see. 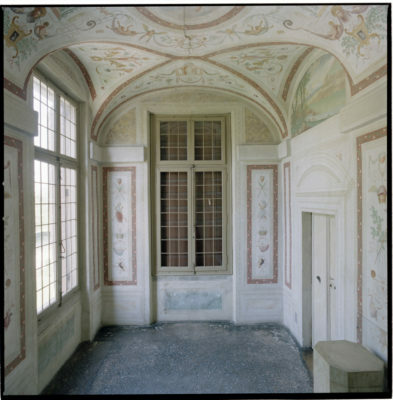 The ground floor of this house, thus within the basement, was where the matters of domestic household functions of that grand house took place, which we can picture was visited by a great number of people that at the time were the social nucleus, called “famiglia”. Therefore, there were “tinelli” (dining rooms) and kitchens, in addition to other spaces assigned for domestic activities. 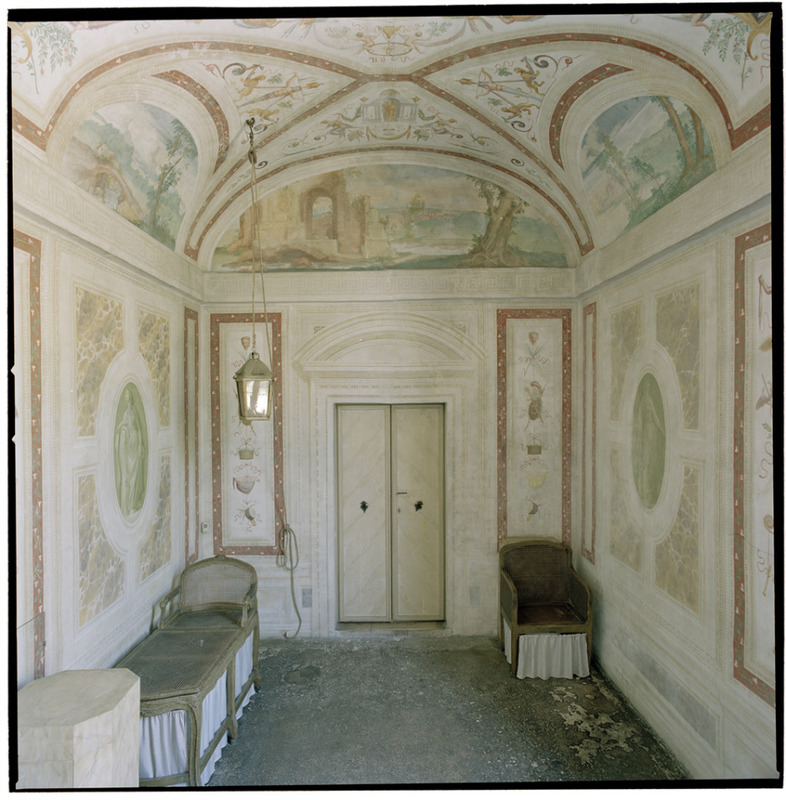 The first floor was called “Nobile,” because it hosted the “Signori” and therefore all the representative functions related to their social rank. The upper floor – that at a later date was turned to be used for domestic household functions – originally served for the gathering of agricultural produce from the rural lands of which this house was the business centre. 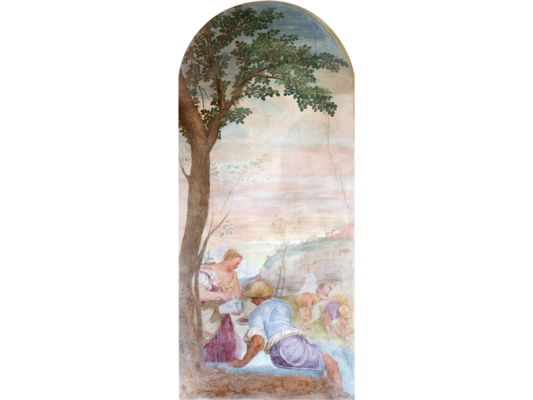 Palladio believed that once the Signore were to establish themselves in “villa,” meaning in the mainland, they were to practice with profit what was called the “Holy agriculture”. We cannot divert our attention from this facade before admiring its perfect symmetry of architectural composition. 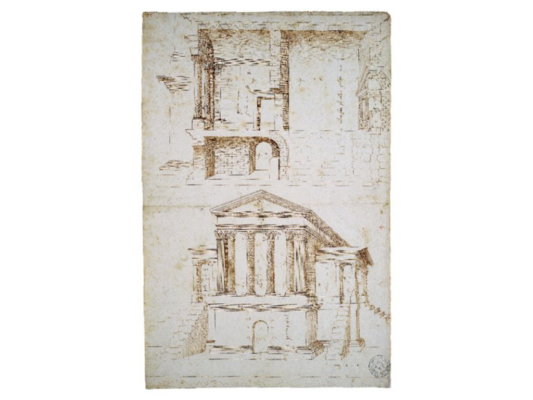 Symmetry is a principle that Palladio normally included in his work, not only because it is a pillar of ancient Roman architecture but also because he believed it to be perfectly normal: even the human body, he writes, is symmetrical. If we go up the external stairs that ascend to the arcade and enter the Piano Nobile or noble floor, we will have an opportunity to observe the architectonical quality of this abstract principle.